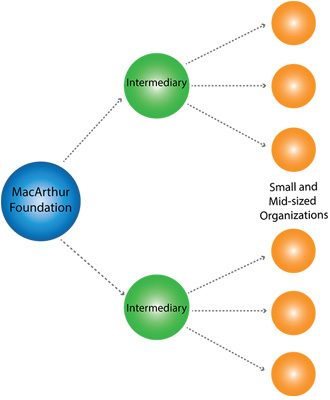 Like a number of foundations, we often make grants to intermediary organizations to take advantage of the knowledge, connections, networks, expertise, and resources of these entities. Through them, we can help ensure that our grants and impact investments reach small and mid-sized organizations or are invested in local projects, businesses, or other financing vehicles. Working through intermediaries can facilitate collaboration with other funders and pooling of resources for re-granting to others. It also makes it possible for us to augment the efforts of our staff with those of individuals with specialized expertise and deep local engagement. This approach also channels local knowledge back to MacArthur, so that we understand the impact of our resources and when it may be necessary to adjust our approach. We often will engage directly with the ultimate recipients of our funds to understand better their accomplishments and challenges. In Chicago, MacArthur Funds at the Prince Charitable Trust and the Driehaus Foundation re-grant our resources to small and mid-sized arts and culture organizations across the city. For more than a decade, LISC Chicago acted as the intermediary for the New Communities Program, which made nearly 300 grants to organizations working to improve the quality of life in 16 low-income, historically African American and Latino neighborhoods in Chicago. With other local donors, MacArthur supports a fund at the Chicago Community Trust that makes small grants to immigrant-serving legal aid organizations throughout the city and suburbs. A grant to NEO Philanthropy supports a multi-state campaign to help bring about state-level change in the administration of juvenile justice across the country. A grant to Global Fund for Children has helped to support and build grassroots organizations that provide educational opportunities to marginalized youth. Impact investments to Neighborhood Housing Services (NHS) have supported homeownership for low- and moderate-income families and individuals in Chicago and the suburbs. In the past five years, NHS has made 713 loans to borrowers, 62% of which were for home purchases on the South Side, and 25% were on the West Side. Impact investments to IFF and the Chicago Community Loan Fund have helped fund projects like the Arts and Recreation Center at Ellis Park, a multi-purpose community center in the Oakwood neighborhood, and Trinity United Church of Christ’s development of Imani Village, a project that will include affordable rental housing, a health center, and an urban farm. Impact investments to create and expand the Housing Partnership Equity Trust, a social-purpose real estate investment trust (REIT) launched in 2013, have leveraged more than $70 million in equity capital, enabling this collaborative of leading nonprofit housing owners operating in 30 states to acquire and preserve affordable rental properties serving more than 2,500 households. Impact investments totaling $30 million to the Opportunity Finance Network, coupled with another $60 million from Wells Fargo, Prudential, and the Kresge Foundation, have funded major loans and grants to outstanding community development financial institutions through the NEXT Awards, an annual competition conceived by MacArthur and launched in 2007. There are many more examples of our granting to or investing with intermediaries. While this approach makes it impossible for every recipient of MacArthur funds to have a direct relationship with the Foundation, we believe that this is one of several effective ways for MacArthur and other philanthropies to operate, as it extends the reach of our resources and amplifies the potential for impact.